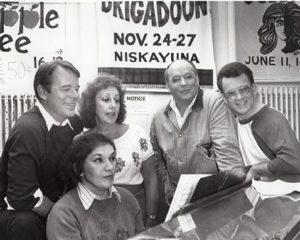 Drew with Alan Foster, Grace DiBatista and others at an 1987 rehearsal. Drew’s rich baritone voice was heard on SLOC’s stage beginning in the 1950’s. His favorite roles included Emile in South Pacific, Nicely Nicely in Guys and Dolls and Pooh Bah in The Mikado. Drew was also a SLOC Past President and Board Member. His artistic talents extended to both painting sets and many signs for SLOC.